Later that night, crying as I packed my things to go back to the orphanage, I heard Maid Fredoka smoothing out my humungous bed. “I don’t believe my mom is really dead,” I said sadly. “Shall I pack your things, Miss Emmi?” Fredoka asked me. She stood up on my bed. “Yeah, I guess,” I answered sadly. 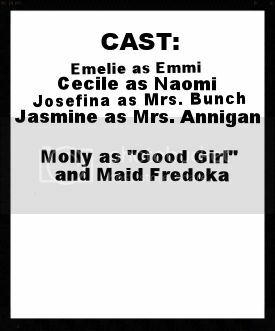 “If I may be of service, Miss Emmi, I’d be mighty obliged to tell you.” Fredoka offered. “OF COURSE!” I cried. “Your mother was my aunt,” she stated firmly, folding my clothes and putting them into my bag. I was shocked, hearing all this. Fredoka was my cousin? Hurrah! I still had family left besides my mother! “But, why didn’t you tell me any of this before?” I demanded angrily. How rude of Fredoka, knowing I was her cousin, to never tell me this! “It never came up,” she answered truthfully. “As a maid, it is rude to speak out of turn, so I couldn’t speak up and tell you without being scolded – or punished – by Mrs. Bunch.” She added. I couldn’t imagine sweet Mrs. Bunch scolding anyone, but I guess it was different for maids. “Thanks for telling me this, cousin,” I smiled. WAIT! I thought. IF MY MOTHER IS STILL ALIVE AND THE BEST BUSINESSWOMAN IN THE STATE THEN I DON’T HAVE TO GO TO THE ORPHANAGE. “Mrs. Annigan! Mrs. Annigan!” I cried, running down the stairs, through the hall, and into the parlor. “Emmi where on earth is your bag? It’s time to leave for the orphanage,” she scolded me. “No, my mother is alive!” I interrupted rudely. “You mind your manners young lady, and I’ll have you know your mother died in a fire!” She snapped. “No, if you would just listen to me,” I begged. She threw me off of her. “Get away from me, you filthy rodent! All your family is dead leaving you in my hands, and because you are the rudest child on the face of the earth when we get to the orphanage, you had better pray to Jesus to save your soul because your behind is mine.” She told me cruelly. Now if only I could report her for child abuse if I could run away from the orphanage. She’d probably whip me at least fifty times. “Yooohooooo! Lookin’ for this?” I asked, smiling mischievously. “You give that back!” Mrs. Annigan shrieked. With that, I ran out the door faster than a cheetah with its tail on fire and into the street in the dead of night. P.S. I got something from AG today :> Can you guess what I got? Oh! Mini dolls? Where they mini dolls? Wow! Which ones where they? Are you making the mini dolls to be like Izzy’s dolls? Ok I’ll tell you what mini dolls: MARIE GRACE AND CECILE MINIS!!!!!!!!!!!!!!!!!!!!!!!!!!!!! I just have a question for you: MADISON ARE YOU TRYING TO GIVE ME A HEART-ATTACK WITH THIS SUSPENSE!!!! I’m so excited! Great story, Madi! I don’t think we do, but you could upload it to tiny pic and post each individual link here in a comment so we can view your photos! I cannot wait for the next part!!! I really LOVE this series. Thank you for being so creative and making this.